For small jobs (one frame) you could probably get away with using a large kitchen strainer (to hold the chopped wax) and a food bowl (to catch the dripping honey) for this part. But as soon as you have a box of frames to extract, something larger is called for. Again, we take a simple, low-cost approach. There are a number of YouTube video's detailing this 'two-bucket' approach. Buy two food grade buckets - around 20 litres in size. They cost around $8-10 each. You can use a smaller (8L) bucket on top, if you limit yourself to extraction of (for example) two Langstroth Ideals (or one full size box) at a time. This would reduce the height of the device and make it easier to store. That's the configuration you see in the pictures below - 8L on top and 20L below. I thought about using a smaller (8L) bucket just for the honey catching (the bottom one) but realised the sieves (strainers) would take up lots space in that bucket, so I stuck with the 20L for that lower part. You can source them new from hardware and other stores. You can also source them (used) from restaurants and food outlets. Buy two large medium mesh sieves (strainers - about $3 each at budget stores) which are close to the same diameter as the bucket but still fit inside. Don't worry about the size of the handles. Buy a 'honey gate' (a special tap for dispensing honey) from your local beekeeping supplier (about $15). Cut slots in the rim of the lower (honey) bucket to allow the sieves to sit securely down inside. They need to be deep enough to allow the lid to be seated on top of the bucket. Cut a round hole in that bottom lid, one that's slightly smaller than the base of the top bucket (and smaller than the diameter of the sieves). Drill a series of 10mm holes in the base of the top bucket, so that honey will flow through and leave the bulk of the wax behind. Note that the holes should form a circle slightly smaller than the hold you cut in that lid. Drill a hole in the bottom bucket (not too close to the base . . .) and fit the honey gate. That's only a brief description rather than a 'how to build'. To learn more, please watch this video. The two bucket system might sound like overkill - but if you are going to use it for a few years, it's worthwhile. 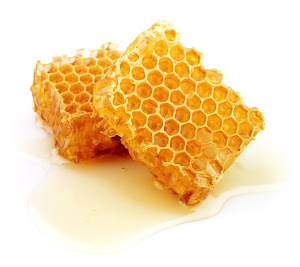 Once you have a pile of honey and wax, separating them quickly becomes very important! Once you have the bucket system working, it's so beautifully simple. Costs around $40 (plus an hour to build) compared with a honey extractor at $500. Guess which is easier to clean and store . . .
Forgot to take a pic when the wax/honey mix was first poured into the top bucket. But here it is the next morning - maybe 12 hours after draining started. All that's left is some sticky wax. After about a day and a half, I removed the top bucket and filled our collection of honey containers, new jars and old jars - that was so satisfying!!! Bucket about 1/4 full (look carefully for the dark line inside). So these buckets would easily hold 2-3 Lang Ideals full of honey or one full sized Lang box. Arguably, one could leave the buckets dripping for days to get the final drops out - some people do. But honey is hygroscopic (attracts and absorbs water). If it gets above 20% water content it will start to ferment and ruin the honey - so I play it safe and get the honey into sealed containers ASAP. Put the sticky wax in a heat-proof bowl or container. Place it in the oven set at 70-80 deg C until it all melts. Let it slowly cool in the oven. The wax and honey separate. You crack a hole in the wax and the warm honey pours out. Place this honey in a separate container and use (I suggest) for cooking since the heat treatment damages it somewhat and is less good for eating raw. 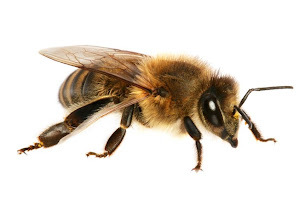 Please do not feed heated honey to bees - it can kill them. Please read up on HMF if you are interested to learn why. Wax cooled and hardened - make a hole and the honey flows from underneath. I used a small sieve to filter into a 'cooking honey' jar. Underneath the wax was a layer of propolis - a surprising amount! Has a nutty sort of smell. Propolis scraped off the wax. Wax now ready for final rendering (purification) process. * You do not have to use two sieves. What you do here mostly depends on how you want to filter your honey. 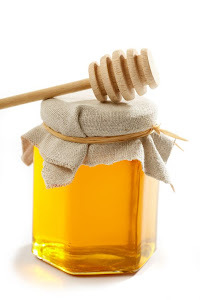 If you don't mind some tiny wax particles in your honey, buy one sieve with a medium mesh. If you want smaller wax particles, buy one sieve with a fine mesh. If you want reasonably fine filtered honey, use muslin cloth as a final filter. Using muslin probably means using two sieves since you want to stop the larger wax chunks blocking the cloth. Experiment and decide for yourself!